Eliminate guesswork when engaging in a conversation. 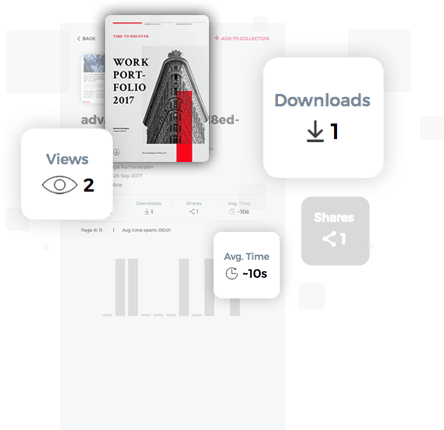 Paperflite instantly alerts you the moment your client interacts with any of the content you shared, so you know exactly when to follow up – or to gently nudge them if they haven’t seen it yet. Gain complete control over your conversation by knowing which sections of the document was read and who they shared it with, so you can prioritize your prospects (and your follow-ups). No matter how hard you try, different versions of your collateral are lurking everywhere. Our seamless integrations make it easier to connect every source you can imagine, ensuring content produced by different teams gets connected to a centralized repository in seconds. With Paperflite, you have complete control of how your content is organized and distributed to your teams so that they can find the right content at the right time. Whether you are running a marketing campaign or sending a one-off message, Paperflite makes it easier to share your collateral without worrying about file-size restrictions. Simply drag & drop your content from anywhere – including blogs and videos – and send them out in seconds. Our beautiful customized themes create an incredible content-sharing experience, and our mobile-friendly viewer makes sure it looks great on every device. Paperflite is the perfect hub for all your content, enterprise-wide. Simple, easy and effective emailing, but with a great new twist. Our QuickSend feature lets you add content from anywhere and share it with anyone at any time. 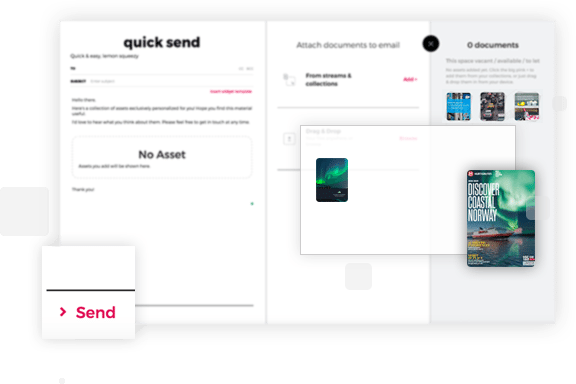 QuickSend takes sharing content over email to a whole new level. Easily drag & drop your content from any source and share it in seconds through the platform whenever you need to. You’ll know exactly what happens to your email after you hit send, with our real-time notifications. Now know exactly how your email is received and engaged with, as it happens. Experience the new way to share content without size limits, and experience click-throughs like never before. Through our innovative interface, content sharing can be adapted to the situation, making sure you enhance engagement. Share your content as a table of eye-catching thumbnails, a unique URL, or as one of our stylish Collection Cards, and make sure that your emails make a measurable impact. Wow your prospects with a unique experience unlike any other. Our unique FliteView gives each prospect an individual microsite tailored to them but designed by you. Know how and when your buyers engage with your content. Paperflite notifies you when your content is accessed, viewed or shared, so you always know exactly what to do next. Instant notification when your content is shared by your prospect to other leads, letting you know who the other influencers and decision-makers in the organization might be. Create your custom-branded FliteView microsite for prospects and make sure that each conversation is unique and memorable, for all the right reasons. Now all the content you’ve shared over multiple interactions will be available in a single view, making sure that your client can find all the relevant content whenever they need to. Your all-in-one platform for curating content, sharing content and measuring content. Paperflite organizes and recommends the right content at the right time, helping you drive conversations forward. 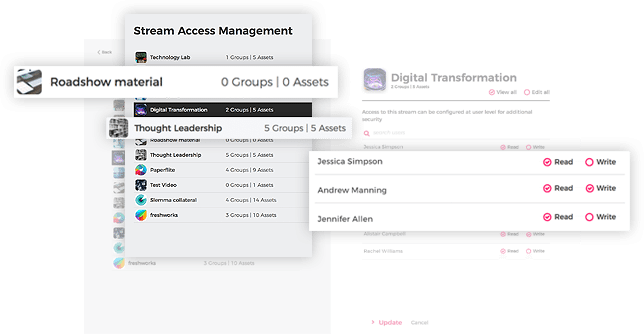 Varied sources of content curated on a single platform with ease, allowing you to ensure that your teams access only the latest and most relevant content. Easily save the content you find most useful by marking it a favorite, and ensure that they’re always accessible, even when offline. Make sure that your team gets the latest content pushed to them immediately, at any time, on any device, without drowning them in endless emails. All your content is securely stored online so that you can access it in just a few clicks whenever you need to, wherever you are. across various teams and geographies – with no IT support needed. Organize all content intuitively in streams, and manage quality control through variable user privileges, making sure that the right content is shared the right way. Your teams can easily subscribe to their preferred streams of choice for instant updates of relevant content that matters. Intelligent recommendations to boost new content visibility, making sure that your teams know exactly what content to use at what point, ensuring effective engagement. Control how your content is used and shared, and sleep easier knowing that your precious content is always in the right hands. enriching your present systems with our one-of-a-kind insights. Sync your content instantly from multiple cloud sources at the same time, including Dropbox, Box, Drive and OneDrive, onto a single platform. Seamlessly syncs with your CRM for effective data sharing with your organization, ensuring that all interactions are consistent and relevant. Track your prospects online across social networks, including LinkedIn and Twitter, and discover what they like and what they do. Manage all your contacts automatically in app, with engagement history and real-time updates, ensuring that you always know everything about them. and understand exactly where and how to improve. Benchmark your top-performing content, so that you know exactly what kind of content works best with your audience. Key metrics to tell you your content’s effectiveness at a glance, and know exactly how much value it brings to your organization. Track how different team members perform across the company, and see who’s sharing the right content at the right time and who needs to improve. Content that stays with you everywhere, on every device, so you’re never out of the loop (even if you’re out of network range). different media into a single customized interface. Organize your content in the context of your next interaction, and make sure that relevant content from every source is shared. Elegant visual representations for your multimedia content that make you stand out from the crowd. Share experiences with your prospect that are customized for them but designed by you, and make each interaction a special one. Pull in different file-types from different sources on to one screen, and keep prospects connected and involved. More features than the DeLorean!